Belgium will continue to be the largest exporter of organic fertilizers, with total exports totalling 1.15 million tonnes in 2015. Netherlands and the U.S. will be the other two key exporters. In terms of imports, France continues to be the largest market globally. Global organic fertilizer demand was pegged at 17 million tonnes in 2016. In terms of value, the market was valued at US$ 5.57 billion. Persistence Market Research projects the market to grow at 7% CAGR through 2025 and reach US$ 10.23 billion. Government initiatives and subsidies promoting the use of organic fertilizers. For instance, in the EU, government is promoting organic sector via conversion subsidies and large subsidies on agricultural inputs. Rising awareness among consumers about organically produced food will continue to provide growth opportunities. From a US$ 15 billion market in 1999, the global organic food and drink market has grown to become a US$ 80 billion market in 2014. Organic fertilizers don’t cause the same level of damage to the environment as conventional fertilizers. This is promoting their adoption among end-users. While Persistence Market Research maintains a positive outlook on the global organic fertilizer market, premium prices for organic fertilizers are a key impediment to adoption. Integrated nutrient supply system (INSS) is being adopted by farm owners, as the lower nutrient content alone is insufficient to supplement the demand for nutrients in plant growth. 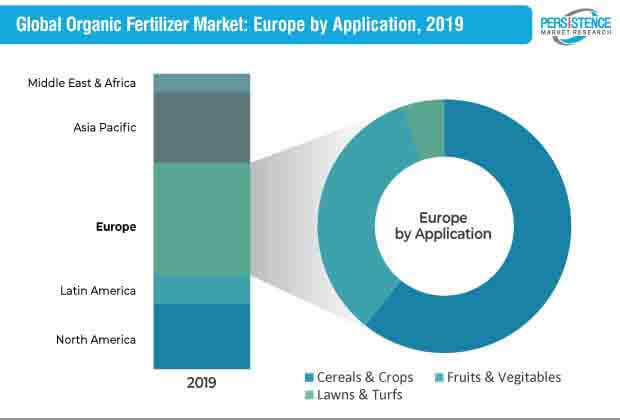 Considering the fragmented nature of organic fertilizers market, leading players are focusing on strengthening their distribution partnerships in local markets. Manufacturers in Europe are focusing on expanding their customer base in high-growth regions, including Latin America and North America. Non-profit organizations are playing a key role in promoting the use of organic fertilizers. According to Persistence Market Research’s analysis, demand for animal-based organic fertilizers is higher than plant-based variants. While 6.84 million tonnes of plant-origin organic fertilizers were sold in 2016, animal-origin organic fertilizer volume was pegged at 10.15 million tonnes. Use of organic fertilizers remains highest in the farming of cereals and crops. This application segment accounted for over 70% revenue share of the market in 2016. By volume, demand from cereals and crops was estimated at 12.53 million tonnes in 2016. Historically, solid organic fertilizers have remained sought-after, and the trend is expected to remain unchanged during the forecast period 2017-2025. While solid organic fertilizers are projected to grow at 6.2% CAGR, liquid organic fertilizers’ growth rate is estimated to be 5.1%. Europe is the largest market for organic fertilizers, followed by Asia Pacific. While Europe will continue to be the largest market for organic fertilizers, it will lose 2.3% revenue share to APAC during the forecast period. North America, the third largest market for organic fertilizers, is expected to account for 21.8% revenue share of the market by 2025-end. In its report, Persistence has profile key players in the organic fertilizers market, including Italpollina SpA, ILSA S.p.A, BioStar Renewables, Sustane Natural Fertilizer Inc., True Organic Products Inc., California Organic Fertilizers Inc., The Fertell Company, Purely Organics LLC, Pupuk Kaltim, and Qingdao Sonef Chemical Co., Ltd.